Intergovernmental Authority on Development (IGAD) heads of state have resolved that South Sudan rebel leader Dr. Riek Machar will not be allowed to take up residence in any of the IGAD countries. The June 21st, 2018 resolution decided that the SPLM/A-IO Leader H.E Dr. Riek Machar Teny should be free to live in the Republic Of South Africa to any country of his choice except the IGAD region. Machar shall be allowed to enter into and exit from Sudan and Kenya for the duration of the peace process and would also decide to deliberate on his final status at the upcoming Ordinary Summit of the IGAD Assembly. The resolution was announced at the 32nd Extraordinary Summit in Addis Ababa. Under the Chairmanship of H.E. Dr. Abiy Ahmed Prime Minister Of the Federal Democratic Republic Of Ethiopia And Chairperson Of the IGAD Assembly of Heads of State and Government and the summit discussed the situation in the Republic of South Sudan on which they failed to achieve any break through. On Monday 25 June, Sudanese President Omar al-Bashir hosted the second round of talks between the two bitter rivals, aimed at ending South Sudan’s four-and-a-half year brutal civil war in Khartoum. The President of Uganda H.E Museveni was in attendance of the IGAD summit of peace lovers in Khartoum hosted by President Omar Al Bashir of Sudan. 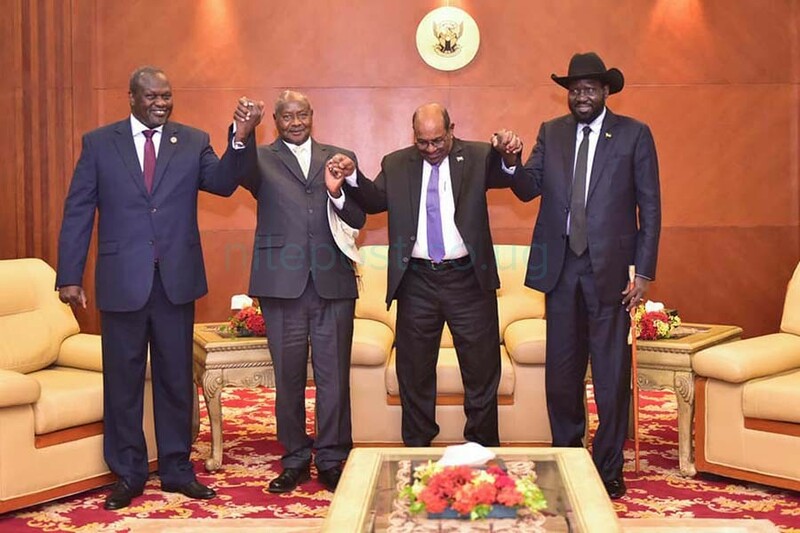 Prior to the IGAD summit in Khartoum ,Museveni joined host President Bashir, South Sudan President Salva Kiir and Mr. Riek Machar in a consultative meeting from which they emerged to hold hands, giving a ray of hope for peaceful negotiations to resume. The East African bloc, IGAD, has encouraged President Salva Kiir and opposition leader Riek Machar to work together to end the ongoing civil war in South Sudan. Kiir had recently turned down a proposal to work with rebel chief Riek Machar, during face-to-face talks in Addis Ababa. South Sudan Information minister Michael Makuei last Thursday said that Machar will not participate in the would-be transitional unity government until elections are conducted. Inter-governmental Authority on Development IGAD was created in 1996 to supersede the Intergovernmental Authority on Drought and Development(IGADD), which was founded in 1986. This followed the recurring and severe drought and other natural disasters between 1974 and 1984 that caused widespread famine, ecological degradation and economic hardship in the Eastern Africa region.